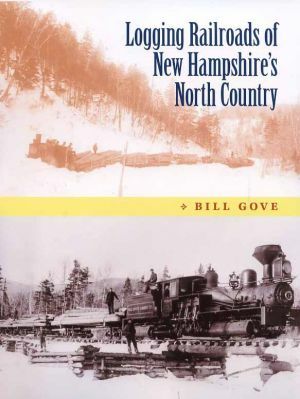 Logging Railroads of New Hampshire's North Country, by Bill Gove, 2010. The fourth in logging railroad historian Bill Gove's series on the logging railroads of the White Mountains. This volume covers the northern and eastern railroads: Wild River, Kilkenny, Upper Ammonoosuc, Success Pond, Millsfield, Johns River and the Mount Washington Branch of the Boston, Concord & Montreal Railroad. In addition to the authoritative text, the book includes numerous sidebars such as locomotive rosters, notable characters and railroad disasters. Illustrated with nearly 150 vintage photos and detailed maps showing locations of railroad lines, logging camps, mills etc. 168 pp., 8" x 10 1/2."